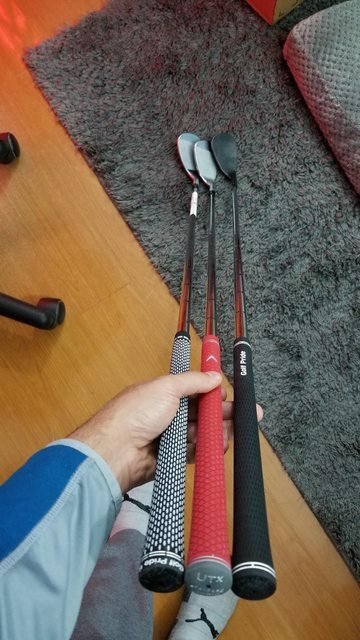 I'm making this post because before I started looking for a new set of wedges I really didn't find a ton of direct head to head comparisons between these clubs. 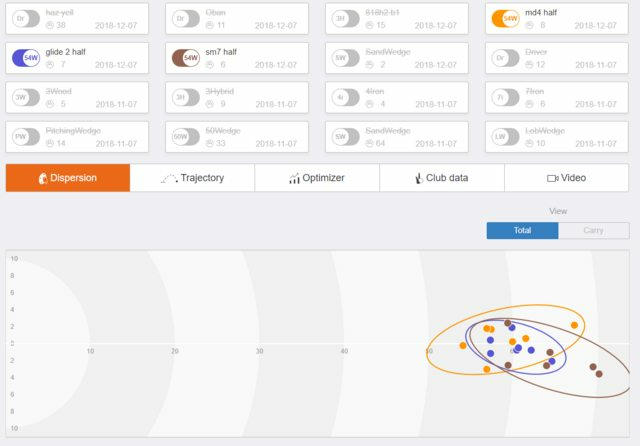 Tons of anecdotal data and single club testing, but nothing that took all clubs and tested them all out at once. Lots of "top 5 wedges" and "hot wedge list" but not tons of substance (at least in my opinion). 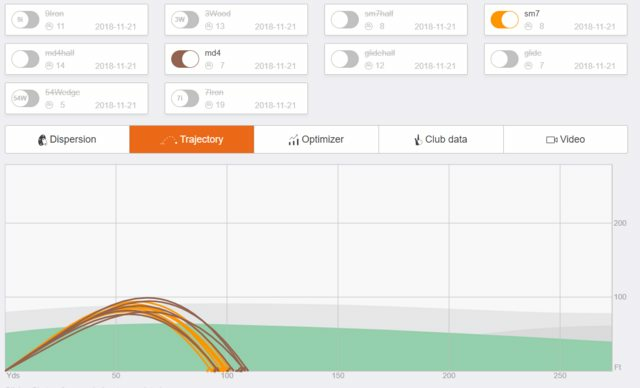 This test will be on going this winter on indoor simulator using trackman and continue into the spring when I get them all on the course for a final decision. I'll continue to update as time goes on if people are interested... if not just for archives sake for when people do google searches in the future. 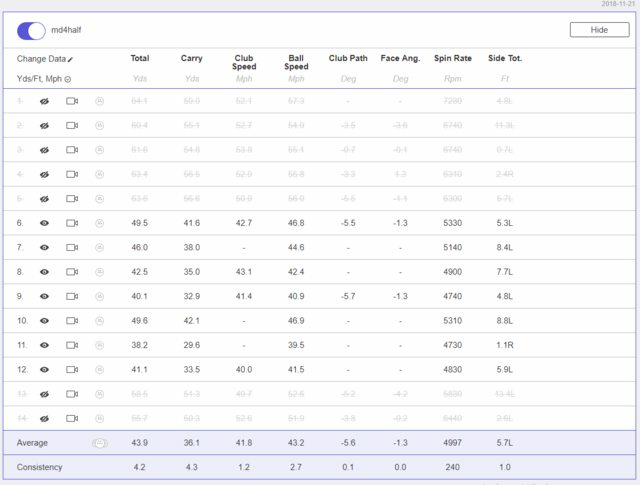 For right now as of 11/21/18, I am testing 58* wedges with "X" grinds, I.E. higher bounces with heel and toe relief. 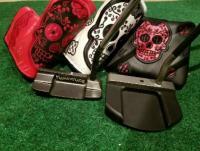 I will eventually test sand wedges and maybe gap wedges later. 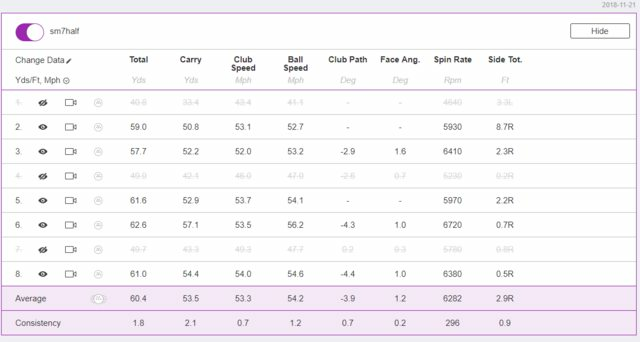 I'll finish off by saying that I am not the best player out there but I wanted to show that fitting and testing wedges could have potential impacts on one's game (or hey, maybe it doesn't). Going out and buying something off the rack because some Youtube pundit says it's his top wedge of 2018 may not be the best idea. Ok now for the good stuff! Let's start with looks - Highly subjective but crucial IMO for a wedge. As you can see, the Glide 2.0 seems to have the longest hosel out of the group and in looks the "biggest" to my eye. MD4 is by far the smallest of the group and SM7 is somewhere in the middle. The color of the MD4 "chome" on the actual groove section is more shiney than on the SM7. The groove area of the Vokey is much more dull looking and really stands out vs the chrome of the club head. The leading edges are similar but I'd say the Glide's is the most straight or least rounded. It's a toss up for me between SM7 and MD4. I prefer the smaller size of MD4 but I like how the dullness of the face on SM7 makes the hitting area stand out. Very small edge to SM7 because when the wedges aren't next to each other, you don't notice the slightly larger size compared to MD4. 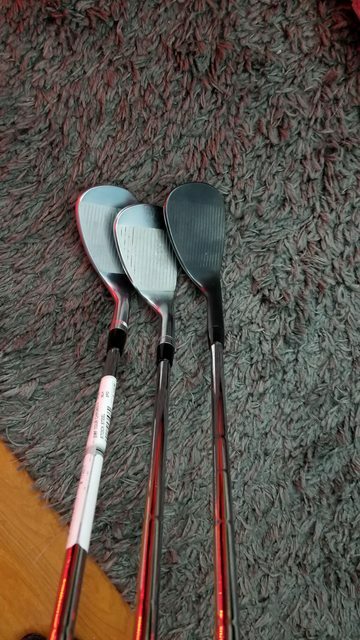 Sound/Feel - Again, subjective...Plus each wedge has the stock OEM shaft installed: S200 "Tour issue" for MD4, Vokey Wedge (I heard it's also an S200) for SM7 and Ping AMT 2.0 in the Glide 2. This is where the differences started to be noticeable for me, more so on full swings. 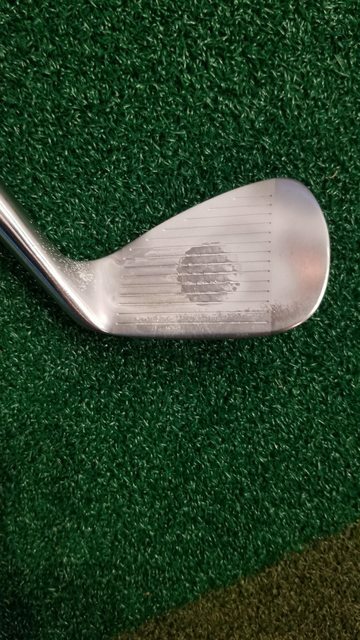 The SM7 was the softest and the MD4 was the most firm and the Glide in the middle... but almost had a kind of hollow feel? Out of the bunch the Vokey was the clear winner in terms of preferred feel on full shots, but on partial shots they all felt pretty similar. 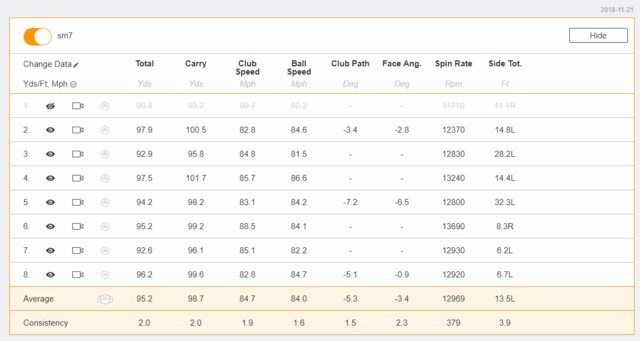 As you can see the SM7 is less efficient in terms of ball speed for me. Not sure if it's the club head DNA, shaft or what have you but it was shorter than MD4 and Glide by a fair amount. However, more important than total distance when it comes to wedges is the actual flight and the consistency of said wedge. Notice the std deviation for carry distance is much better with SM7 than Glide and MD4. The spin is also much more consistent, especially compared to the Glide. Honestly, the Glide felt kind of unpredictable as I was hitting it. I was striking the ball fairly decent today but I felt like with the Ping the ball came off "hot" compared to MD4 and definitely SM7. Lastly on full shots, let's notice the peak height. To me, this is a pretty important factor with wedge play as I strongly prefer the lowest flight I can get while maintaining good spin. It's somewhat obvious now, but you can see the Glide and MD4 goes higher than SM7 but SM7 spins the most. Alright now comes partial shots. I tried to be as consistent as I could be, but this is definitely a tough spot in my game. I was using each wedge and trying to hit 60 and 40 yard shots. I hit each distance at a random time so I wouldn't get in too much of a groove. Now I will be the first to say here... I did not do an awesome job hitting the 40 yard shots. Looking shot for shot though... performance seems to be pretty similar between them at those low speeds. 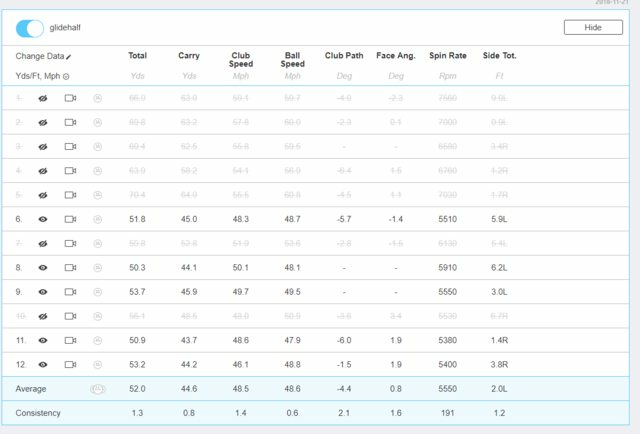 Luckily, I got each club to carry 42/43 yards at least once, and on those shots each wedge was pretty much identical.. SM7 had the slight edge there. Anyway... As you can see here, I really struggled with the Glide to keep my distances down and under control but I was super consistent with it on the shorter of the shots which was surprising. For the 60 yard attempts, everything was fairly equal again but I did feel the most "in control" with the vokey. Okay so this post was extremely long and if you actually read this far, then you've managed to break through the typical 2 min attention span most of us have and I applaud you. I plan to keep testing these wedges in the coming weeks to gather more data because so far the verdict is mixed. I like the looks, feel and flight of SM7 but I seemed to be more consistent with the Glide on partial shots. 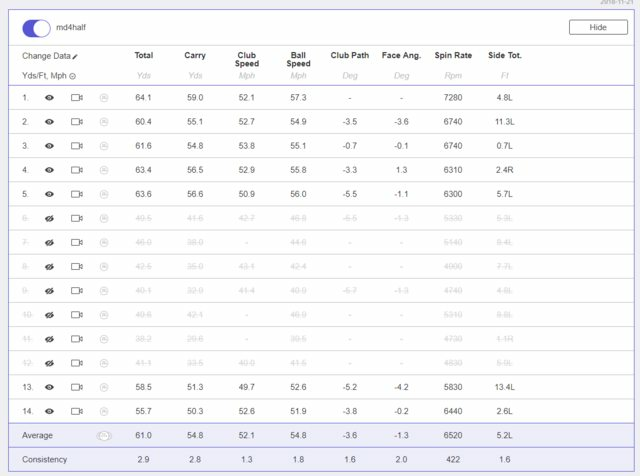 SM7 also was the shortest on full shots although I do not take many full lob wedge shots on course. I will probably leave this post as is and just update it with which post numbers that I make which have updated data. 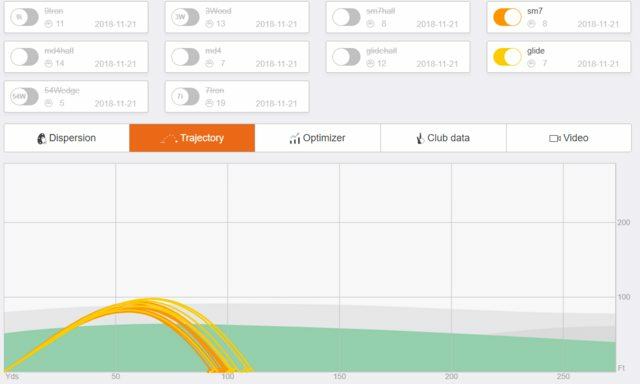 After I get more data I plan to install different wedge shafts to see how this effects flight and feel. Feel free to ask any questions if you have any. Stay tuned! I bought the new Cleveland RTX4 wedges that come stock with the Dynamic Gold S400 shafts. I like a lot of bounce as well so I bought the 52° and had it bent to 54° and the 56° and had it bent to 58°. They are the softest feeling, best sounding wedges I have ever hit and I have a bag of wedges in my garage. Worth a try for sure if you’re out trying wedges. 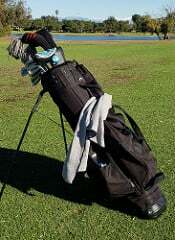 I also play a Vokey 62° and a Callaway Apex Pro 50°. Very good post. Well done! If I can find a good deal I will definitely add it. I'd probably get a 56/10 and then bend up weak to 58/12. Only difference would be that is the "mid" grind which is more similar to the S grind and doesn't quite have as wide of a sole, or as much heel relief. I did own RTX 3 though for a second and it was very soft. Just hated the offset. First off, this is interesting stuff. The data makes it so. More useful than opinion alone. And it kind of agrees with my findings. A longtime Callaway wedge devotee, I tried a Vokey SM7 50 F grind and it was so good. Like you, I found it No. 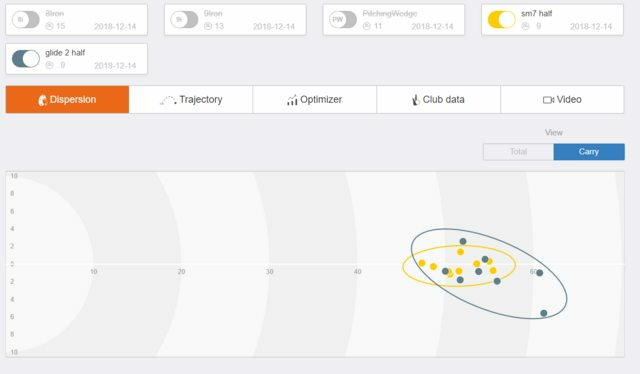 1 at hitting the ball the same distance every time. Really a great wedge. I am going with a Cleveland RTX4 (56 bent to 55) as my sand wedge and still undecided on the 59/60, though I like one wedge with a compact head and my Hogan TK 59 is hard to displace. So nimble. Never quite hit it off with the Glides. Liked the Glide 50 more than the higher lofts, but for me the balance and perfect weighting of the Vokey won out. I could very well add another F grind at 54/55. I like the full grinds out of bunkers. Great write up, Zig. I look forward to reading future results. What grind is the sm7? Yeah the sand wedge test will be interested because right now I've been using the MD4 54/12 with the W grind for a little while. Really good out of bunkers but tough to play some hardpan type of lies because the sole is a little more rounded, unlike the F grind which is a bit more flat. However the W grind seems to have a hint of heel relief kind of built into the design of the sole so I feel like it opens up a bit nicer. That testing will have data like this but will rely a lot more on outside testing, which will be more opinion based because I don't have a GCQ unit to see spins, etc. Thanks for doing this! I keep going back to my SM6s... I just bought some RTX4s, and they are great but I had a low bounce 56 which wasn't really for me, guess I could have bent it up for some more bounce but I sold it... still have the 50/10 and I will agree with the above poster, it does feel good. I had the same experience as you with the Glide 2.0 Stealth. Fantastic looking wedge but felt really unpredictable, especially if I missed by just a little bit. The SM6 feels the most consistent all over the face for me, but the RTX4 are worth a shot also. Do you think the Glide hosel looks the longest because it's black with the black ferrule? I love the look of the Glide but was underwhelmed with performance and feel.... surprised to see the spin that much lower, too. Thanks again, very coo to see some real numbers. Only on the 40-50 yard shots. For 60-70 and full shots (105-110) it wasn't. Just in general on longer hits, it felt harder to control. It felt very fast coming off the face. Ymmv. But how many full shots do you actually take with a 58* wedge? For my game...basically 0. I never take a full swing with my LW. Last year I tested the glide 2.0 vs sm6 and rtx3. I found some similar results in that the rtx3 were the least visually appealing. I also think generally...vokeys are a lot of $$$ for what you get. Same models every year. I went with the glides in the end. As you said...to each his own. Yeah very rarely do I take a 100 yard lob wedge shot. I'd rather hit a half pw and keep it really low. I'm going to do more testing for sure and I won't make a final choice until I can game them all next spring. Chipping and how it performs laid open will be of particular interest. Lefty??? Sounds like the Glides were best overall! I'm mixed still. They went the furthest and were the most consistent on my shortest pitches, but they felt the hardest to control. They also flew the highest which obviously goes along with going the furthest, but I tend to desire the lowest flight possible while maintaining good spin. I'm heading back to the launch monitor tomorrow. Not sure if I can add more data to that current set, or if I have to start over from scratch. I have a few shafts I need to test out for my driver, so I won't have as much time to dedicate to the wedges. Either way, I'll try and grab as much as possible, see if I can develop any kind of pattern or correlations. I'm somewhat leaning Vokey but the MD4 headshape looks best to my eye and gets me a touch more distance. Okay so went back and did more testing. Kept it short because I had other things to do during the session. Really I am most interested in the 50-60 yard shot with my LW and how consistent I am. Spin is fairly important but it's so dependent on strike that I actually chose not to track it because I didn't want to be "turned on" by the most spin. My aim was to a pin 60 yards away. 1) The glides were the most consistent, but were consistently short of the flag. Not bad for a middle or back flag, but not good to a front pin. 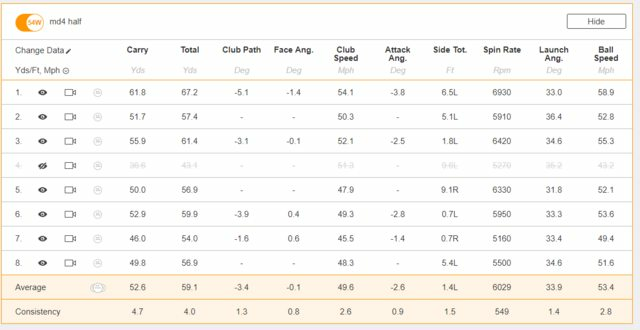 2) I was least accurate left to right AND the least consistent with Vokey's, but I was the closet on average front to back. In fact... only a few feet front to back on average. 3) Maybe these S200 TI shafts are on to something?? My face angle was super consistent with MD4. Maybe it's a weight issue? I believe it's the heaviest of the lot. I plan to do one more test next week doing more 60 yard shots, and maybe some 40 yard ones, but I'm really not faced with tons of those. 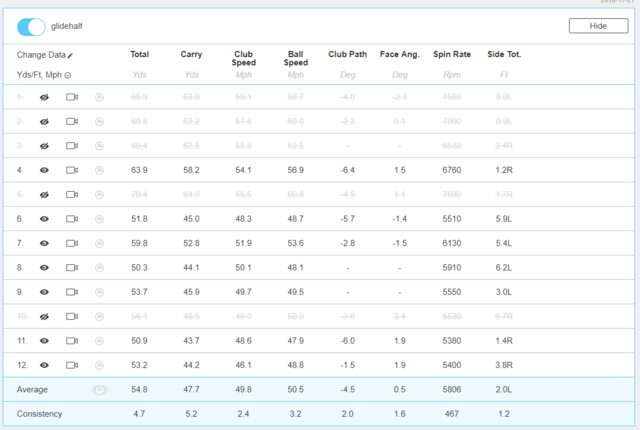 From there, I'll pick an unofficial "winner" which will get a Modus 125 wedge shaft installed, and then I will compare all this data with the stock shaft to it, to see if that shaft improves anything. My current thoughts are that from a looks department the vokey's have it. Love the shape, love the feel. MD4's feel the most firm and the Glides are the softest. Even though I don't feel dialed into the Glides, they seem to be giving me some really good numbers. 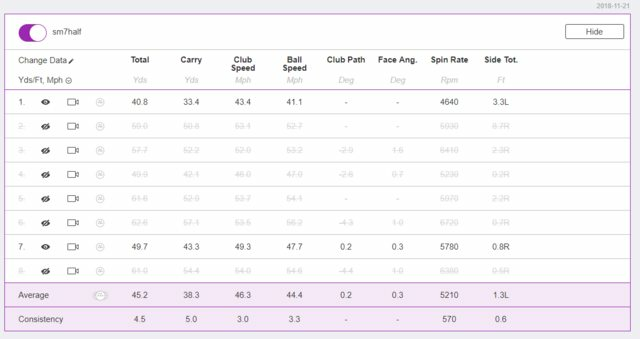 FWIW I hit some full shots with each club and the Glides are insanely long... It's to much. These are 58* clubs and I'm able to carry the glide 120. It's just silly. I'd probably have to use a 52 56 60 set up if I went with them. Interesting. I love my glides.... Never liked the vokey. Interesting read for sure. I think I may test each of the shaft with the Modus wedge... The reason I think the Glides are harder to get the right distance is the shaft is a bit lighter feeling. Whether it's static weight or balance point (have not SW'ed any of these yet, pure stock) heavy shafts just feel better to me, especially on these partial shots. Thanks for reading. 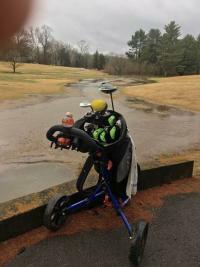 Just wait til spring comes, I'll be doing on course testing with everything. Bunkers, deep rough... Hard pan, etc. 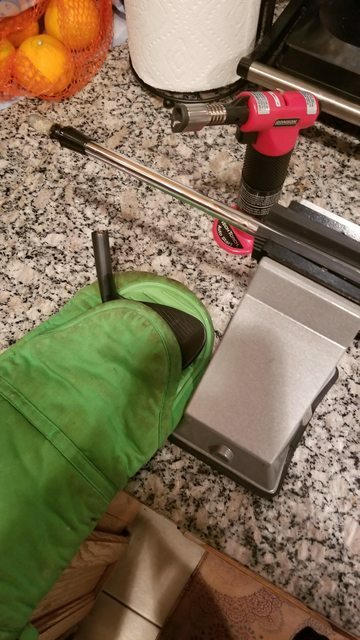 For the time being I'll be putting the Glide in my bag, although it's winter so it kind of doesn't matter. I will also be removing the stock AMT shaft and putting in a Modus 125 wedge to see how that feels and if it changes my numbers at all. After this I'll be purchasing some sand wedges, both Glide 2.0 and maybe an SM7 although I really only seem to find the 54 or 56/10 in the S grind the most online on eBay. Looking for more of a full grind but a bit of heel relief, which the F grind is not but the SS from Ping is. My MD4 sand wedge is a W grind but has a lot of camber and a bit of heel relief built it. The SW test may only be between MD4 and Glide 2.0. Plus.... I don't feel like owning 3 full wedge sets, haha. Nice to see a decision made with some actual testing and data. Sometimes you just have to go with what works best. I'll follow along for the SW testing too. Sm7 was better today. I honestly think that for me.. this AMT shaft is iffy. It feels a little light compared to the S200, but to be honest I have no idea on the specs. Maybe balance point?? All in my head??? who knows. I still need to slap the modus 125 in these heads to see what it does but I think that I cant go wrong either way when it comes to these 60 yard pitches. Where things will really become clear I think will be during the spring in the bunker and out of the rough. 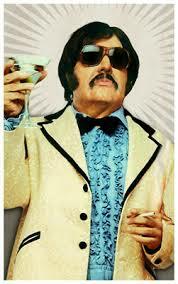 For now... it's whatever, a club is a club, I'm just trying to stay fresh in the off season. No biggie, lemme just rip this PW back 20ft because 14k spin. LOL. My guess is the loft is somehow about 50* instead of 47*. Anyway, I've got a glide 54* coming in sometime soon which I will be comparing to the MD4. Not going to even bother with SM7 for the SW slot because none of those grinds will really work for me unless I modify them in some way. I'll also be buying gap wedges soon, likely just Glide 2 and Vokey. You might not see any new updates for a bit with Xmas coming up, but I do really appreciate any of you who are following along. Doing these tests is kind of expensive but I think it's fun & educational to me and all of you. I hope anybody reading is learning from my trials here. Alright used the 58* Glide with the modus 125 wedge. 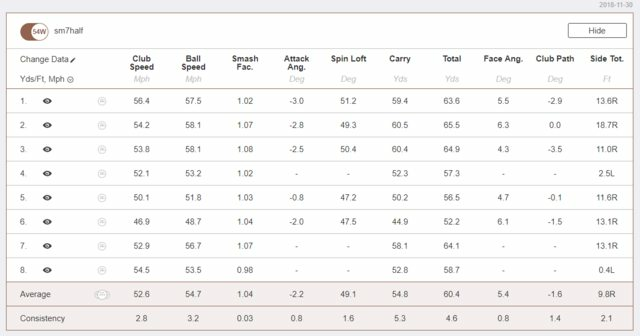 I'm not going to post the Trackman data but if for some reason you want to see it, let me know. Essentially it did exactly as described... It lowered my launch just a touch, lowered my peak height a bit, and lowered the spin. I didn't notice a huge difference in weight or stiffness, but if I had to make a choice right now after once use, I'd say it's not a winner for me. I was only getting about 5500-5600 spin on my normal "shallow" 60 yard pitch shot. I was getting much closer to 6k spin with the stock AMT shaft. It feels a bit light though in the AWT... I'll have to look at the specs to see if it really is or if it's just a balance point thing. Might just stick with my modus 115 that I had in my last set. Shots of 30-40 yards were pretty low spin but with some technique I was still able to get over 7000 on a 40 yard pitch... but it's really not my go to shot. I also tested the MD4 54* and the Glide 54* which I will post about soon, with data. The short of it though, is that the MD4 seemed to out perform the Glide. More spin, a bit better control and consistency. This is going to KILL my OCD if I end up with a Glide LW, a MD4 SW and a Vokey GW. Yeah we'll see....I'm going to go with what the data tells me but it will be a struggle to have 3 unmatched wedges, let me tell ya. Don't you dare play 3 mixed wedges...you would drive yourself mental. Seeing as now your testing has expanded and become slightly more confusing, the best idea would probably be to hit them all outside in the spring and see which work best for those touch shots around the green in addition to full shots. I’m interested in seeing your 50gw data. I have stealth 2.0 with AWT and am afraid of front pins as I’ve spun off a few times . Thinking of putting same PX 6.0 as my irons. I don’t mind the AWT in my 54 as rarely go hard at it. I did hit it and I do have data... It did spin a crazy amount. I didn't get as much distance as I should have but it is a 52 so I need to get the loft checked abs adjusted to 51*. Need to mess around with my modus shafts in it, too.